We have spent years verifying the family legend that our great great grandmother Agnes Dettmann, nee Kroll, was the illegitimate daughter of Prince Wilhelm of Prussia, later Kaiser Wilhelm I of Germany, and his sweetheart, Princess Elisa Radziwill of Poland. After much research and a number of crucial DNA tests the legend has become fact, and our book entitled ‘Agnes: The Secret Princess. An Australian Story’ by Belinda Dettmann and Jane Stevens, was published on 5 January 2015. The emblem shown here is the monogram used by Wilhelm and Elisa, showing their entwined initials - E and W. It seems appropriate to represent their daughter Agnes, the secret princess, using their monogram. In 1824 Prince Wilhelm of Prussia and Princess Elisa Radziwill were very much in love, but they had been forbidden to marry. Their story is known as one of the most tragic royal romances of the 19th century. But were they in fact lovers, and did they have a child? A young woman named Agnes emigrated to Australia in 1848 to became the matriarch of a family in which it was whispered that she was a princess. Such stories abound as old wives’ tales and most of them are unfounded, but this particular story is true. How did this happen, and how did it remain a secret until now? 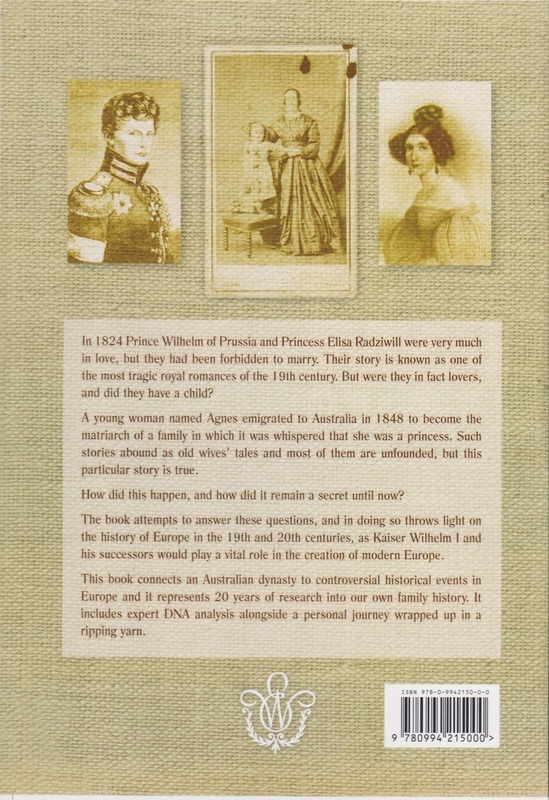 This book connects an Australian dynasty to controversial historical events in Europe and it represents 20 years of research into our own family history. It includes expert DNA analysis alongside a personal journey wrapped up in a ripping yarn. Title: Agnes the secret princess : an Australian story / Belinda Dettmann & Jane Stevens. Author: Dettmann, E. Belinda, author. William I German Emperor, 1797-1888 -- Family. Royal houses -- Europe -- Genealogy. Other Author: Stevens, Jane, author.